What is the "Utah Boating Safety Certificate"? Do I have to get the Boating Safety Certificate? How do I get my Boating Safety Certificate? What does the Boating Safety Education Course consist of? Does the course need to be completed all at once? What if I don't pass a Chapter Review Quiz? Do I have to complete the course before I can take the Certification Exam? What if I don't pass the Certification Exam? What is the "Temporary Boating Safety Certificate"? When will I receive my Boating Safety Certificate in the mail? Is there a time limit to complete the final exam? Is there a time limit to complete the online course? Q. 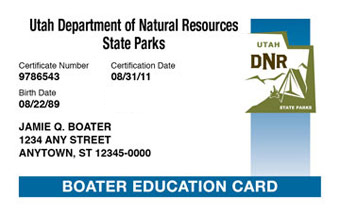 What is the "Utah Boating Safety Education Certificate "? A. A Utah Boating Safety Certificate (sometimes referred to as the Utah Boaters License) is proof of competency of the basic rules of the water that all boaters should know. Q. Do I have to get a Boating Safety Certificate? A. If you are 12 to 17 years of age and wish to operate a motorboat you are required to get the Boating Safety Certificate to operate on Utah waters. Q. How do I get my Utah Boating Safety Certificate? For a complete overview of the Utah online boating exam process, please visit our Utah Boating License Online Exam Process overview page. Q. What does the Safe Boating Course consist of? A. The safe boating course for Utah is made up of 9 chapters broken into relevant and related subject matter. Each chapter consists of a number of pages all of which have been given a minimum study time. Each of the pages within a chapter must subsequently be studied for the minimum required time before you can proceed to the next page. Once you have studied a chapter in its entirety you will be able to access the 10 question chapter review quiz. All the questions are multiple choice and related to the material just covered in that chapter. A passing grade of 80% is required for end of chapter review quizzes and a failing grade means the chapter will need to be repeated. Once a chapter is completed and the review quiz has been passed you will be able to proceed to the following chapter. After all 9 chapters and review quizzes have been completed you will be able to take the certification exam. A. No. The course is convenient and allows you to complete it at your own pace. When you sign up to take your Safe Boating Course online with BOATERexam.com® you will be issued a 'username' and 'password' which will allow you to log in and out of the course any time you please. Our customized Boater Exam Center keeps track of your progress within the course and each time you come back, simply log back in and continue where you left off. Q. What if I don't pass a Chapter Review Quiz? A. In the event that you don't pass one of the Chapter Review Quizzes simply take note of the areas in which you experienced difficulties as shown in the Post-Quiz critique. You will then be required to return and review the chapter material again before you can attempt the quiz again. Make sure you're ready before attempting a Chapter Review Quiz! Q. Do I have to complete the course before I can take the Certification Exam? A. Yes. All of the chapters and review quizzes must be completed before the Certification Exam may be taken. Q. What if I don't pass the Certification Exam? A. No problem. At BOATERexam.com® there is no cost to retry the exam if you do not pass at first. The initial fee for the certification exam allows you to retry the exam at no extra cost. You will receive your score immediately upon completing the exam and you will be able to review your wrong answers. In the event that you don't pass, you can review the course material and take the exam again at no cost. Q. How much does the exam cost? A. There is a one-time fee of $29.95 paid to BOATERexam.com®. It includes unlimited attempts at the final exam. There is an additional $5 state fee for your Utah Boating Safety Certificate. This also gives you access to an instant temporary certificate that you can print out immediately. Learn more about BOATERexam.com's Risk-Free Policy. Q. What payment methods are accepted? A. We accept payments by VISA, Mastercard, AMEX, PayPal, and Prepaid vouchers. Q. What is the "Temporary Boating Safety Certificate"? A. The Temporary Boating Safety Certificate is a temporary proof of competency and proves that you took your boating safety education course and passed the certification exam. This certificate is valid for 60 days from the date you take your exam and should be carried with you when you boat until your permanent Boating Safety Certificate arrives in the mail. Q.When will I receive my Boating Safety Certificate in the mail? A. Your card should arrive in roughly 3-5 weeks from the date you take your exam. Q. Is there a time limit to complete the final exam? A. You can take the final exam at any time, day or night. The exam is not timed but inactive exams will be erased after 24 hours. A. The exam consists of 60 multiple choice questions, all with colorful and helpful visual aids, an educational tool exclusive to BOATERexam.com®. What is the passing grade for the certification exam? A. The passing grade is 80%, or 48 correct answers out of 60 questions. Over 98% of our students pass the final exam on the first try! If, however, you don't pass the final exam, just give us a call and we'll issue a full refund. 97% of our students recommend the online course to others. Our course is the best in the industry and we stand behind that promise. If we don't meet your expectations, call us for a full refund.